This was originally published on my personal blog on August 28th 2012. 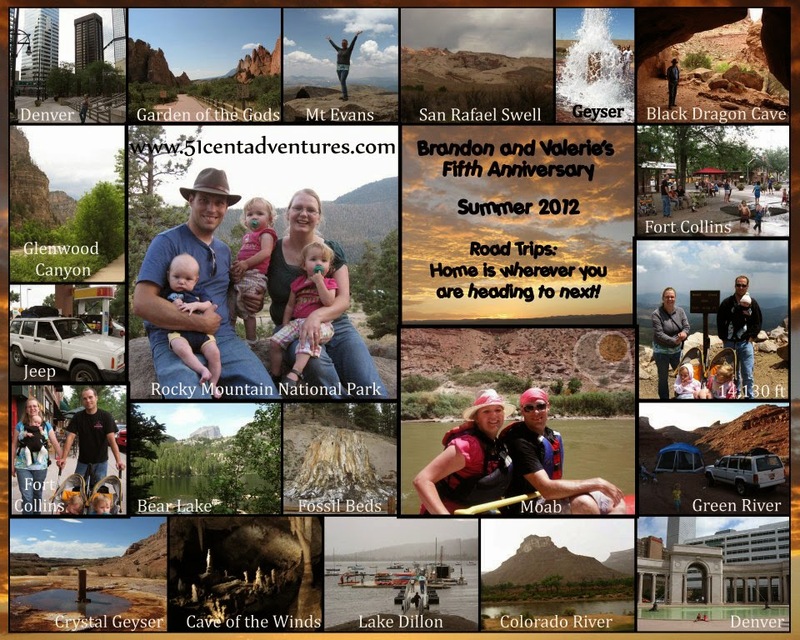 In July we completed another successful road-trip. This year we went to Colorado and played around. We had a great time together as a family. We put 1300 miles on the jeep. And we did it all with three kids under the age of two in tow. Here are some tips we learned along the way for how to make vacationing with babies easier. 1. Admit that it will be hard. Oh my goodness it is hard to travel with babies. It's even harder to camp with them. But road tripping/camping is something my husband and I enjoy doing. We want our kids to experience it. So we do it. We figure that it can only get easier. Also daily life is pretty hard too. It's nice to have a diversion from the usual work of washing dishes and picking up toys. Even if that diversion is setting up a tent and cleaning out the car. Part of the fun of these road trips is the planning process. I ordered a map of Colorado as a Christmas present to myself. (They are free if you go here) When it arrived my husband and I sat down and started talking about places to go and routes to take. Over the next few months I read guide books and searched the internet. As I researched I paid particular attention to things that would be stroller accessible and hold a toddler's attention. We knew we wouldn't be able to do EVERYTHING we wanted to do. Even without the kids it would be impossible to cram everything into ten days. Early on we decided that we would focus on things that were unique to Colorado. We would avoid the waterparks, zoos, aquariums, butterfly pavilion, and even the Air-force base. Those were things we could do one way or another in Utah or elsewhere. We went on a lot of short, stroller friendly walks. It would have been nice to go hiking, but it just wasn't practical. We also went to a lot of parks. The kids put up with our activities and we figured it was only fair to do something that they loved. One of the reasons we picked Colorado as a destination was to visit my sister. It turned out that her family was able to go with us on most of our adventures. I'm so glad that we had two more adults to help watch the kids. Sure they had two kids of their own, but somehow 4 versus 5 was a lot easier than 2 versus 3 - especially when setting up the tent and cooking was involved. Some of my favorite memories as a kid are of staring out the car window and making up stories as we drove. I want my kids to have the same opportunity. So that is why we don't have a DVD player in the car. (And maybe because I'm cheep too) Instead of movies we brought along a bag of toys. Whenever the kids started getting a little fussy I'd start handing back toys. And they would play with them. I was especially happy when I would turn around to see my daughter showing her toys to her brother. At home we have blackout curtains on the kids' window. The curtains keep out the morning sun and ensure that the kids will usually sleep until after 7:00. That's not an option on a camping trip. The kids were up around 6:00 each day. Luckily they were great at falling asleep in the car. So we would plan to drive for about 2 hours every afternoon, just to make sure they fell asleep. Once we were even lucky enough to pull over to the side of the road and get our own nap time. We discovered that the best way to get the kids to bed was to make the bed time routine as familiar as possible. We brought the girls' pillows, babies, and bears along. We sang, read, wrote in a journal, and prayed with them exactly how we do it at home. We gave them bottles and binkies. And when all else failed, they were in pack-and-plays so they had to stay in one place and fall asleep. The last thing I want to deal with on vacation is a sunburned, itchy baby. So every morning I made sure to slather the girls in sunblock. My son technically was too young for sunblock. Most days I'd put a hat on his head and keep him in the shade. But I wasn't ashamed to slather it on him too if I knew we'd be in the sun a lot. The girls love sunblock - the same way they love candy - they want to eat as much of it as possible. So I found the best time to put sunblock on them was when they were strapped into their car seats. That also helped me keep track of which arms and legs still needed to be covered. One of the reasons we camped at an RV park in Colorado Springs was to have access to the laundry mat there. We knew there was no way we could pack enough clothes to last through the whole trip. We brought our own soap so we didn't have to pay extra. Our morning routine involved me getting the kids ready while Brandon organised and repacked the car. By the end of each day the inside of the car was a disaster area. Toys, water bottles, milk bottles, treats, and blankets were scattered everywhere. We were always so tired we didn't care. But each morning Brandon would put toys back in the bag, refill water bottles, put powdered milk into the milk bottles, clean up candy wrappers, and refold blankets. He would also put each bag and accessory back into its proper place. The jeep would be ready to take us on another day of fun. Road trips in general are not the time to do elaborate meals. Even less so when kids are involved. We ate things like canned stew, pasta and sauce, and instant oatmeal. One reason we love our vacations is because they are the one time of year we justify buying things like pudding cups, granola bars, fruit cups, string cheese, Capri sun, nutty bars, Twizzlers, caramel bars, and lots of other food that we usually avoid because it's either too processed or too expensive. We were able to stay sane during our non-stop week with the kids because we'd gone away by ourselves the weekend before. I don't necessarily recommend doing it right before your family vacation (packing is a nightmare), but make sure you do get away. We thoroughly enjoyed sleeping through each night, reconnecting as a couple, and going places without a diaper bag. Our kids also enjoyed spending the weekend with their grandparents. One of the tricks for a successful road trip is to bring along as little perishable food as possible. The girls are still heavily dependent on bottles of milk (don't judge me) so I was a little concerned about how we were going to bring along enough milk for them. Luckily, they don't mind the taste of powdered milk. So we just brought that along. We treated it the same way we did formula. We'd pre-measure it out into bottles and then add water when needed. My son just nursed the whole time. Of course there were times when all three kids were crying as we drove. When that happened we just rolled down the windows to drown out their crying.